As regular visitors to this website will know, I did quite a lot of drawing last summer while working in Speyer. These large pieces were done with grey oil pastel on thick white paper. I particularly liked the grey oil pastel line against the stark white paper and since returning to Scotland I’ve started working on smaller drawings – these based on my landscape paintings. There is one difference though …these pieces are done on board that is coated with white gesso. The gesso I use has a slightly course texture to it and this gives the pastel marks a slightly sharper appearance. 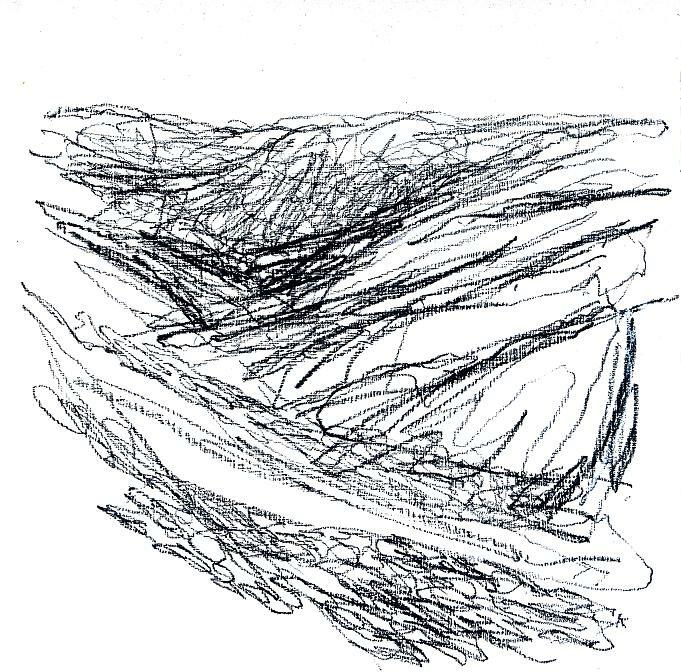 ‘Drumochter sketch is one of two such drawings currently being exhibited in my exhibition ‘On the hill – impressions of the Scottish upland landscape’, at The Strathearn Gallery in Crieff. The exhibition runs until 12th March and so if you haven’t had a chance yet to get along to see it, there’s plenty of time. The work in the exhibition can be viewed by visiting www.strathearn-gallery.com .